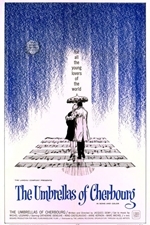 The Umbrellas of Cherbourg is a 1964 French/German international co-production musical film directed by Jacques Demy, starring Catherine Deneuve and Nino Castelnuovo. The music was written by Michel Legrand. The film dialogue is all sung as recitative, even the most casual conversation (similar in style to an opera). 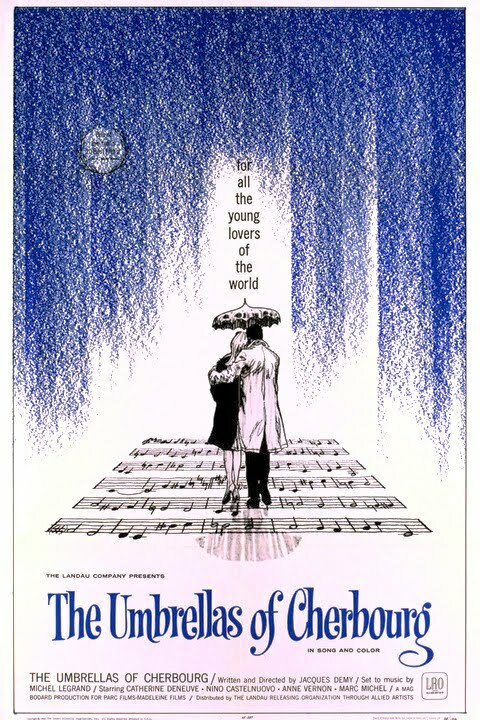 Umbrellas is the middle film in an informal "romantic trilogy" of Demy films that share some of the same actors, characters and overall look; it comes after Lola (1961) and before The Young Girls of Rochefort (1967). The film was very successful in France with a total of 1,274,958 admissions. The plot is very similar to Marcel Pagnol's trilogy of plays entitled Marius, Fanny and Cesar. The musical Fanny was based on Pagnol's trilogy.